Notes is a Free Responsive Product Launching Landing Page template. It's designed with HTML5 & Bootstrap 3. It is a unique product launching landing page. Every Product owner needs a sales page or product launching page at some stages before they start selling their products. Almost all of them use a sales page for this purpose. Here is a Free Responsive Product Launching Landing Page Template called Notes for you to make a Product Launching Page of your own! It is nicely crafted with HTML5, CSS3, Bootstrap & jQuery designed by Themefisher. You can check out the developers website here. You have amazing product. And before buying it, buyers would like to see its specific product informations so that they can make the decision of buying your app easily when it will be out in the market. That’s the first phase of marketing your product. And for that purpose, Notes- the Beautiful and Free Responsive Product Launching Landing Page Template will help you to a great extent to market your awesome product. All you need to do is to buy a domain, download this free template and set up your unique website and let users know when your product will be launched. You will find places for adding the great features of your product and you will also be able to let them know the exact date you will be launching it. Not only tha, you can also tell them if they are in the top 50 or top 100 list and if they will get a special discount! Voila – Many of your potential buyers and customers will be in hurry to purchase your great product at special discounts you will be offering. Now you have a smartphone, your wife does, your children does and even your Granma may have one! Everyday, a humongous number of people are buying smartphones, tablets, iPads. The number is growing at an exponential rate. So if you have a responsive mobile friendly product launching website, that will give you more advantage over your competitors. Along with that, google will give your website priority in the search result too! Then what are you waiting for? Search the responsiveness of notes here on Am I Responsive. Notes has a very attractive color scheme. It has a clean and minimal design. Good typography and great content strategy along with Notes – a Free Responsive Product Launching Landing Page can make the difference. The good news for you is, those are already present in this free responsive product launching landing page template – Notes! If you like this Free Responsive Product Launching Landing Page Template useful, please don’t forget to share it with your friends! 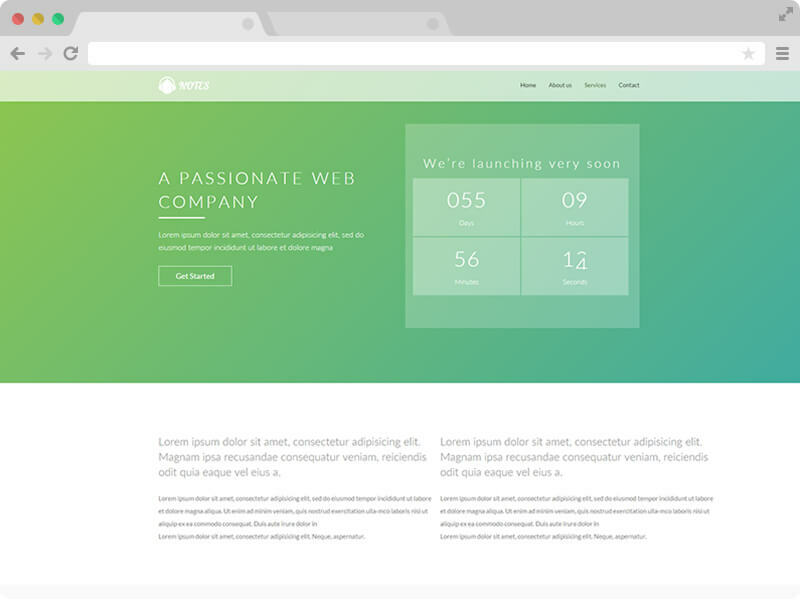 This free responsive html5 business template is created by Themefisher. There is a bunch of Free and Premium Responsive HTML5 Website Templates and Responsive Bootstrap Themes in ThemeWagon. You can browse All Premium Templates by Themewagon here and All Free Responsive Templates by Themewagon here. Just wanted to let you know I love it! Very beautiful work, clean and easy to customize, great work dude. how to edit the countdown timer? and how to activate news letter sign up? If you don’t know how to do that please consult with a web developer. Can you just give me a hint?